Boothe Brothers Music was founded in 1983. It was started because the owner was tired of driving 20 miles to buy strings. He opened a store in his home town of Spanish Fork Utah. The store started with one guitar on the wall. After he paid off his orange Ford Pinto he took out a small loan to buy inventory. In order to keep it afloat in the early years, he taught 60-70 private guitar lessons per week to pay rent and for an employee to run the shop while he was teaching. 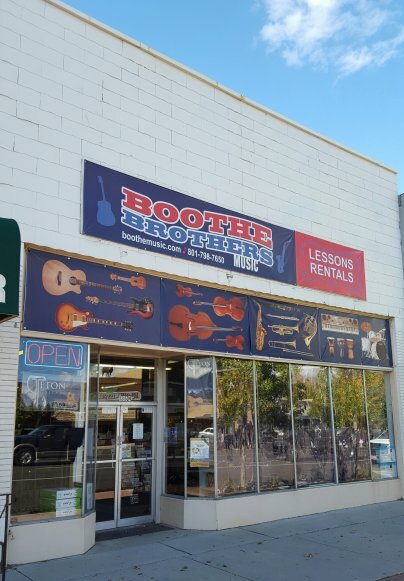 Today Boothe Brothers Music has two locations. We have a large selection of guitars, ukuleles, banjos, mandolins, and many other fretted instruments on display. Our inventory also includes hundreds of band, orchestra and folk instruments of all types. We stock over 5000 different titles in our sheet music section and service, repair and maintenance most instruments. We are lucky to have some of the best teachers in the Utah valley teaching right out of our store. Our teachers offer lessons for guitar, bass, banjo, mandolin, ukulele, cello, violin, viola, voice, and drums. If you are looking for another type of music instruction, we would be happy to help you find someone in our area. Music is our passion. In order to promote live music Boothe Brothers Music purchased a theater and sponsors a free weekly jam session showcasing local talent on Thursday nights starting at 8 p.m. It is always free and family friendly. A host band usually plays about a half hour set, during which time you can sign up to get on stage with your band or jump in and play with the host band. We get some of the best players in Utah out to the jams so even if you don’t play, come on out and enjoy the show. Check out the theater schedule here, and feel free to contact us if you'd like to schedule your own concert. (Phone hours (mountain time) are 10:00am-7:00pm Monday-Thursday, 10:00am-9:00pm Friday & Saturday, closed Sunday).